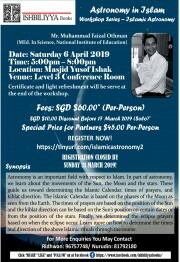 Astronomy is an important field with respect to Islam. In part of astronomy, we learn about the movements of the Sun, the Moon and the stars. These guide us toward determining the Islamic Calendar, times of prayers, and kiblat direction. The Islamic Calendar is based on the phases of the Moon as seen from the Earth. The times of prayers are based on the position of the Sun and the kiblat direction can be based on the Sun's position on certain dates or from the position of the stars. Finally, we determined the eclipse prayers based on when the eclipse occur. Learn more on how to determine the times and direction of the above Islamic rituals through the course. 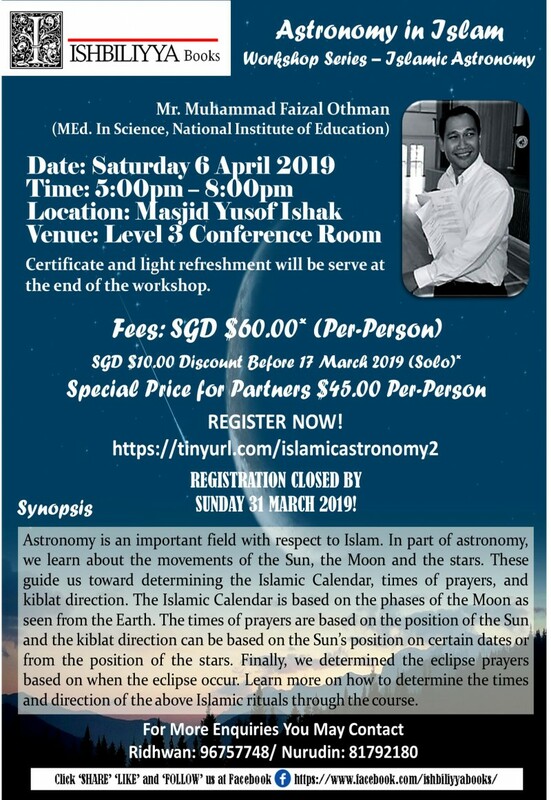 We will share the basis: Islamic Calendar, Times of Prayers, Kiblat Direction, Viewing of Hilal and Solar/Lunar Eclipse. Certificate and light refreshment will be serve at the end of the workshop. Short-View Documentary: Science & Islam by Prof. Jim Al-Khalili from BBC 4 - Participants will get the glimpse of watching this documentary during the light refreshment. Discount of SGD$10.00 offer for solo participant before Sunday 17 March 2019.